If you want your own space to cook, your own space to watch TV, and your own private bedroom, take a look at this Montana fifth wheel. 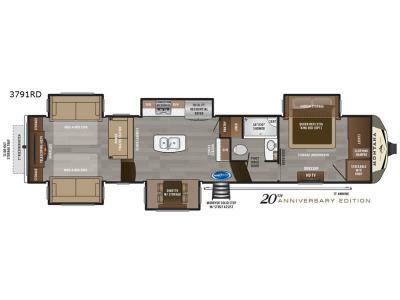 This layout offers a rear living and entertaining room with plenty of seating including dual hide-a-bed sofas and theater seats with power recliners. Imagine everyone gathered around the HDTV and fireplace to talk about their day, watch a movie, or relax for a while in the warm indoors. The kitchen offers a separate space to make and eat meals. You will find a center island, an 18 cu. ft. residential refrigerator, a convection microwave, and a pantry, plus more. 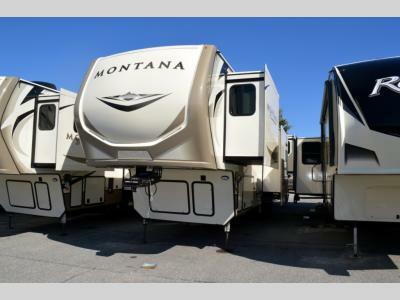 There is inside storage throughout for your clothes, camping gear, and kitchen cookware. And outside there is exterior compartments including a slide out storage tray.